The #1 app for neurosurgery in the world, three times mentioned in iMedicalApps’ “Top Apps“, CE marked and over 300,000 downloads! NeuroMind.cc offers interactive clinical decision support and clinical classification and grading systems. The app is officially supported by Surgical Neurology International and the European Association of Neurosurgical Societies (EANS). The latest developments can be followed on the blog. The new logo is created by Studio Piranha in The Hague, The Netherlands. NeuroMind for Windows 8 is available since November 2012, and can be downloaded free of charge from the Windows Store. It contains all the scores that are available on iOS and on Android, but it does not yet contain the decision support items. Specific updates on the Windows 8 version are available here. The overall most rated and highest rated application out of all applications reviewed. Simply a must have for neurosurgeons and also neurologists. For a free app boasting this kind of content, it’s certainly worth the download. You might say it’s a no-brainer. NeuroMind for Android is a great app for keeping neurology skills sharp. 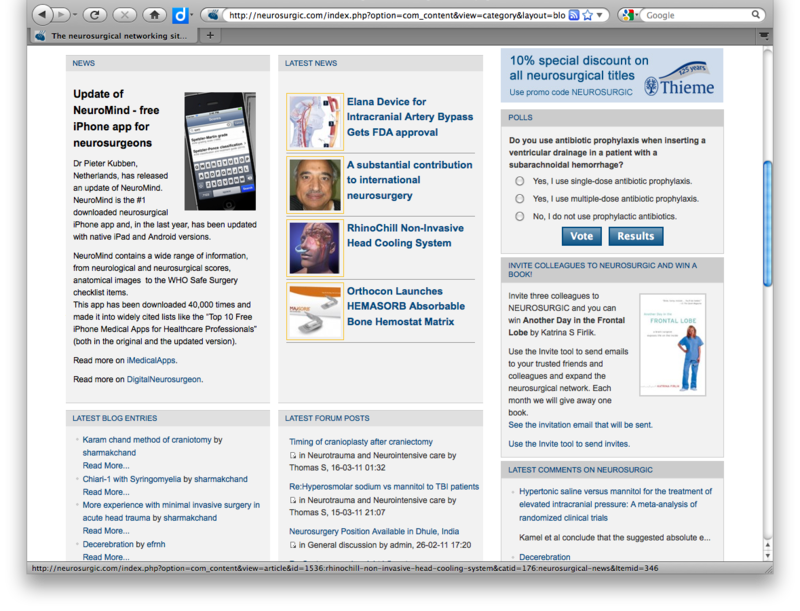 The neuromind app is very great resource for surgeons, physicians, medical students and other healthcare professionals. This app acts as a reference guide and companion to the entire surgical process from start to finish. A great app for neurologist, neurosurgeons and medical students. Neuromind is the topmost application for neurosurgery in the world. An excellent app specifically targeted at neurosurgeons, neurologist and students working on neuro-based subjects. Written by a neurosurgeon, this app contains all the neurological scores you need. NeuroMind can take physicians through a series of questions to help diagnose a patient who has had a head trauma or is unresponsive. Great app, and a needed pocket companion for any modern neurosurgeon. Thanks for a great job! Very useful resource. It is very useful for both practice and residents. Excellent application, all important scores, scales avaiable in one go. Very useful, thanks a lot. Your application is a great help for daily work! Thanks for this app. It is the best free neuro app. – Evgeniy Starkov; neurologist, Tolyatti, Russia. Excellent and very useful! I am an internist and use it everyday; thank you. Thanks for all ur hard work on this app! This is a wonderful app for learning neuro-assessments. This is an amazing app. Thank you so much!!! As the graph below shows, NeuroMind is really used all over the world! Best neurosurgical clinical tool according to Zaki M, Drazin D. Smartphone use in neurosurgery? APP-solutely!. Surg Neurol Int 2014;5:113.
Review of Neurosurgical Smartphone Applications 2012. Journal MTM 1:4:4-10, 2012. Among more than 40,000 health and wellness apps, top doctors on HealthTap have chosen to recommend NeuroMind. We’ve very recently launched AppRx, and 1 U.S.-licensed doctor has already recommended NeuroMind. Congratulations! To highlight your accomplishment and build trust with existing and new potential users of NeuroMind feel free to use our customizable “Doctor Recommended App” badge on your website or blog at no cost. Adding a few lines of code found here (https://www.healthtap.com/apps/468/promote) to your site takes less than a minute and will showcase the “seal of approval” given to you and your app by top doctors. Just like you, we’re app developers too, and know how challenging it is to create great apps (like yours) that people love and doctors trust – so we’d like to thank you for making the world a healthier, happier place, one line of code at a time! The best App of neurosurgery of the world, Excelent. Will really like to see and use this app for sure. You write awesome posts but you should rank your website higher in search engines. If you are looking for a powerful tool for accelerating the Cloud search process, then maybe I can help you. If it’s hard for you to find Email Marketing comparison sites, then maybe I can help. If you are looking for the best voip provider maybe I can help you. If it’s hard for you to find Digital Transformation comparison sites, then maybe I can help.